It certainly is. Indeed of all the many fine musical moments Led Zeppelin would accumulate throughout their eight-studio-album career, Kashmir remains one of their hallmark tracks. It’s of the same order of class as previous touchstone moments Whole Lotta Love and Stairway To Heaven – that is, destined to transcend all musical barriers and become universally recognised as a classic. It was also arguably the last time they would scale such heights. A musical and metaphorical drive toward some irresistible far-off horizon (utilising the same signature DADGAD tuning that guitarist Jimmy Page had previously used to create such memorable showcases from his repertoire as White Summer and Black Mountain Side), Kashmir encapsulated Led Zeppelin’s multi-strand approach to making rock music: part rock, part funk, part African dust storm. Originally titled Driving To Kashmir, the song had begun as a lyric Plant had been inspired to write in the autumn of 1973 after a long, seemingly never-ending drive through “the waste lands”, as he put it, of southern Morocco. Nothing, in fact, to do with Kashmir, in northern India, at all. Musically, the juddering rhythm had erupted out of a late-night session involving Page and drummer John Bonham during one of the band’s regular stays at Headley Grange, the haunted mansion in East Hampshire where they recorded so many tracks in the early 70s. The number was temporarily abandoned when recording was halted by the unforeseen disappearance of bassist John Paul Jones, who had decided to leave Zeppelin after becoming appalled at some of the more ‘vivid’ off-stage scenes surrounding the band’s notoriously outrageous US tour in the summer of 73. After a deal was brokered with Jones that included the band relocating to the plush nearby Frencham Ponds hotel (except for Page, who stayed behind at Headley) Zeppelin recommenced at the beginning of 1974. It was now that the serious work on Kashmir was completed, with Jones sketching out what would later become the orchestral parts with his Mellotron. Plant, though, struggled. Delighted with his lyrics, he admitted he was “petrified” and “virtually in tears” at trying to sing along with Kashmir’s unusual rhythmic pattern. The finishing touch was the addition of real string and horn parts, recorded in May that year at Olympic Studios, in London, where overdubs were also laid down. The finished track was a truly epic rock classic, panoramic in scope, featuring the full-spectrum Zeppelin sound. The bigness of Kashmir fitted Page’s increasingly lofty ambitions, his burning desire to prove wrong the naysayers who had hounded Led Zeppelin in the press since the band’s inception. 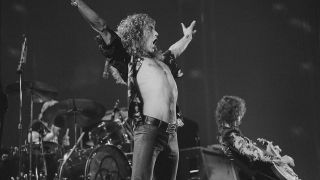 Physical Graffiti was an album all about scope (it included both the longest and shortest tracks the band would ever record), and Kashmir was to be the jewel in the crown; Page determined to showcase the “bigger palette” Zeppelin had at their disposal than nearest rivals like the Stones, who Zeppelin outsold but had never matched for credibility. There were also some moments where cloaked references to Page’s ongoing obsession with the occult could be discerned: images of ‘Talk and song from tongues of lilting grace’ and a ‘pilot of the storm who leaves no trace, like thoughts inside a dream’ – pilot? Or Magus, perhaps? Performed for the first time on the band’s 1975 US tour, Kashmir became the new centrepiece of the set, Jimmy stomping around in his specially designed new suit embroidered with dragons, crescent moons, spangly stars, blood-red poppies and the ‘ZoSo’ emblem. That “great change”, though he didn’t know it yet, was fast approaching.